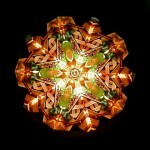 Kaleidoscopes are an interactive kinetic art form. The three categories and styles listed here are based on the time periods in which the works were created, the styles of the kaleidoscope exteriors that have been created and the interior image design. Artists are continually pushing the boundaries of the possible and there are kaleidoscopes and images that are strictly one-of-a-kind and will never fit neatly in a category, style or design. 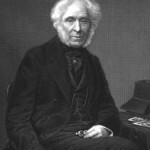 The first category is by the major time periods in which the kaleidoscope originated. They include their invention, their widespread use as toys and finally the kaleidoscope renaissance when the kaleidoscope began to emerge as a modern art form. 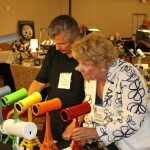 Antique or Historic Kaleidoscopes were made in the 19th century and were created by craftsman who were jewelers, clockmakers, machinists, metal smiths and scientific instrument makers. Toy Kaleidoscopes appeared near the beginning of the 20th century and are still made today. These inexpensive scopes usually have paper, metal or plastic exteriors and contain polished metal mirrors. They are mass produced and widely distributed. 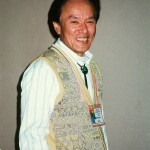 The American GI carried them after WWII and introduced their magic to children around the world. Almost everyone has taken one of these apart to find out how it works. 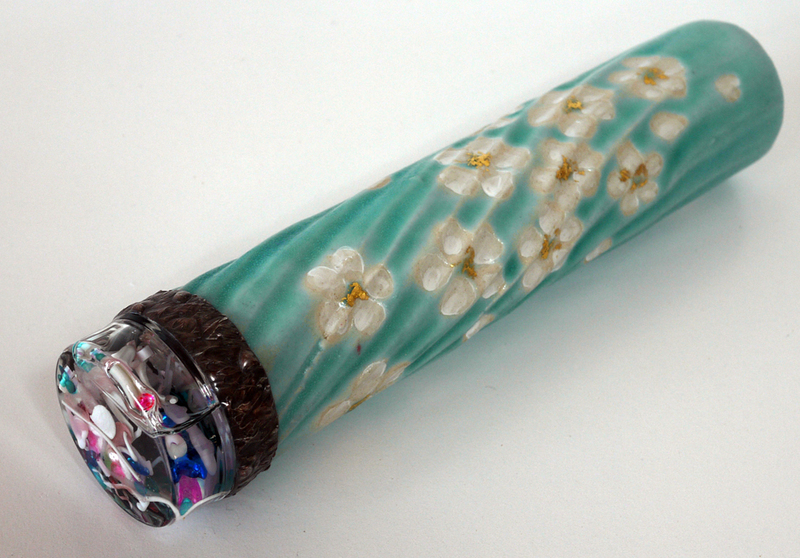 Some of the early toy kaleidoscopes are highly prized by collectors. 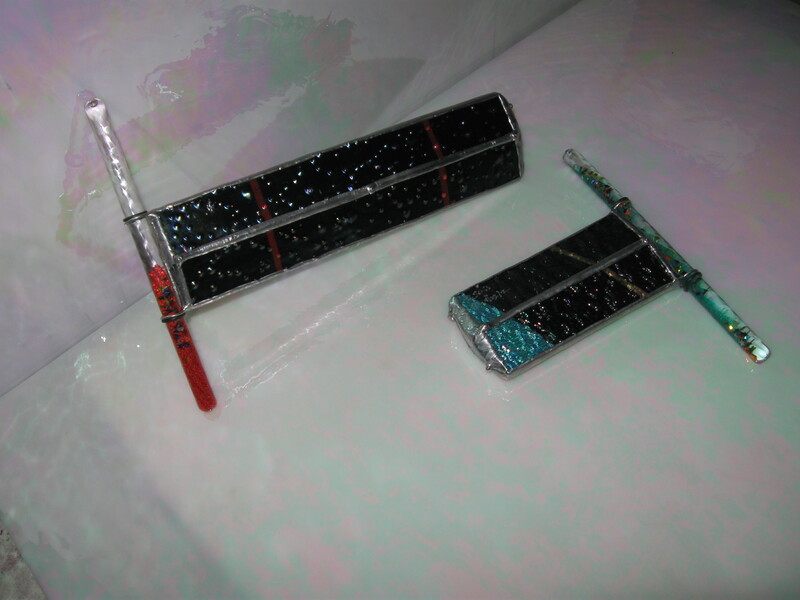 Modern Art Style Kaleidoscopes began to be designed with the advent of the space program in the mid-20th century. First surface mirrors that were developed for space going telescopes, were soon being used to create inner space images in the new art form of the modern kaleidoscope. The second category is based on style of the exterior design which includes size and use. 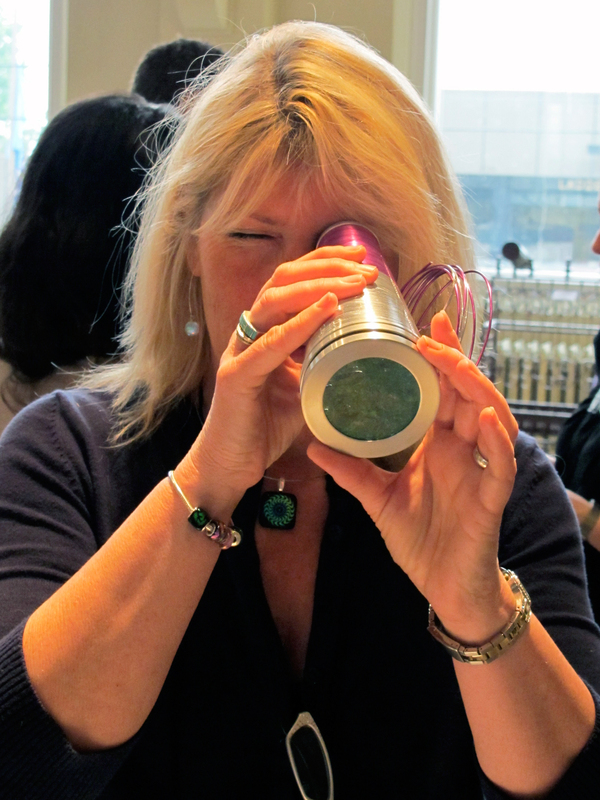 Hand-held Kaleidoscopes are often a tube enclosing 2 or more reflective mirrors. 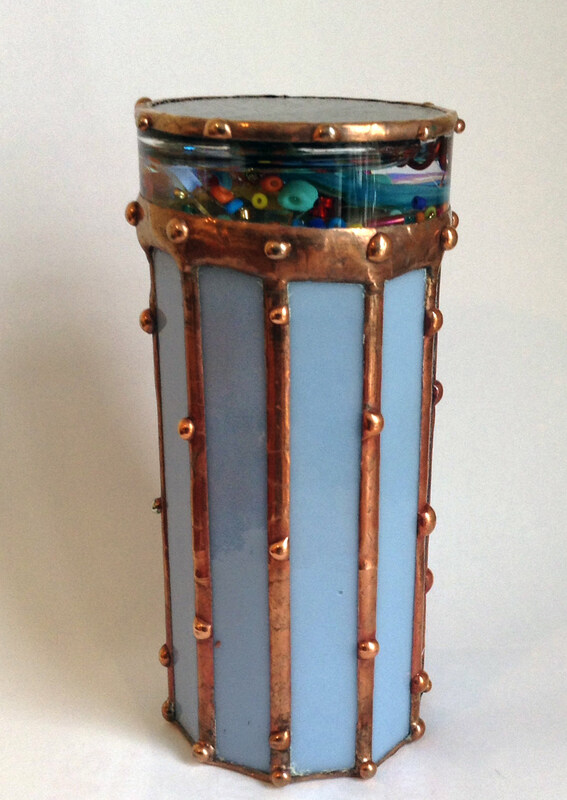 The tubes are usually made from turned wood, plastic, paper, glass or polished metal. The entire scope is held in the hand and may be turned as a unit to change the image or the end containing the objects may be designed to turn separately. 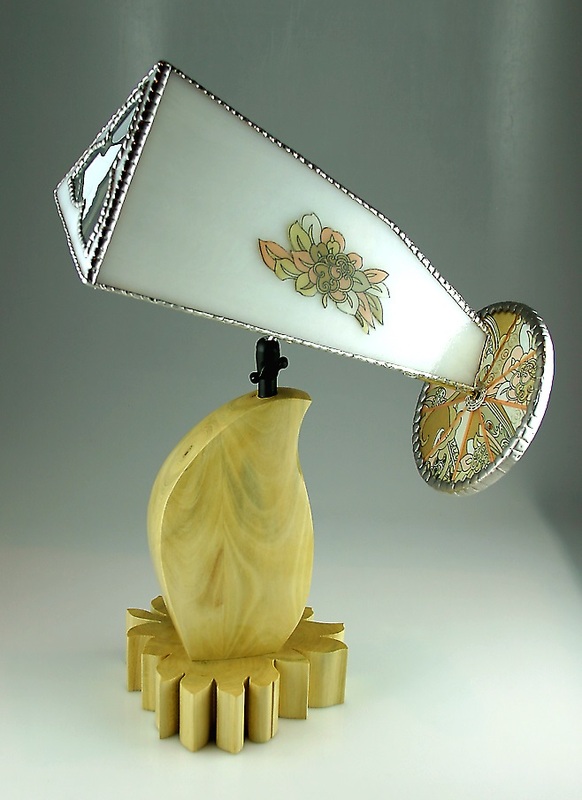 Parlor Kaleidoscopes are made to stand on a table and usually have a pedestal base. They can be made from any media or material. Parlor kaleidoscopes may be viewed comfortably while a person is seated. 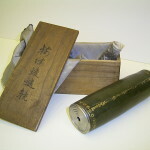 The object case turns by hand or by a mechanical means. 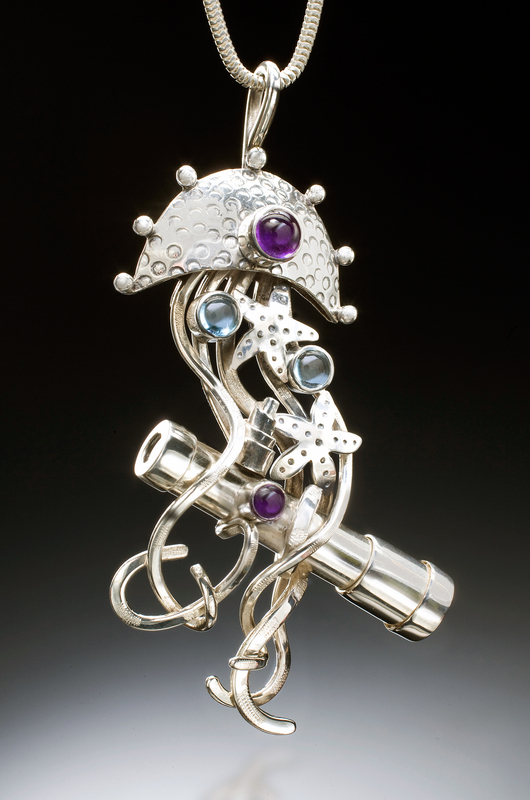 Jewelry Kaleidoscopes are made to be worn in the form of a necklace, ring, earrings, pin as a personal adornment. Great skill is required to fashion the working parts to ensure a great image. Small gems often make up the image and the body is often made of a precious metal. A lens is usually built into the viewing end to magnify the image. 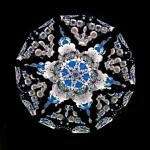 Sculptural Kaleidoscopes are those whose exterior conforms to sculptural standards. 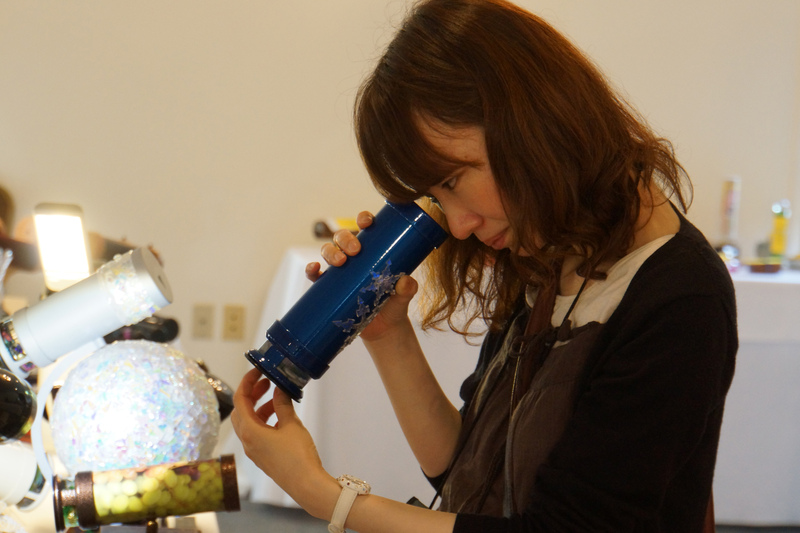 They are often larger kaleidoscopes that may be exhibited on a stand or on the floor or may be used in an outdoor setting. Some of these have been placed as public art. 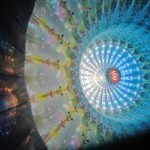 Architectural Kaleidoscopes are very large kaleidoscopes and are built into buildings. They usually allow for many people to view them at the same time. They also add to the ambiance of a structure. Projection Kaleidoscopes are built to project the image to allow for crowds to share in the experience. They can be projected on a screen, around an entire room or on a building’s exteriors. High Tech Kaleidoscopes include computer driven kaleidoscope images and digital camera technologies. As other technologies continue to advance, artists will find ways to use it. 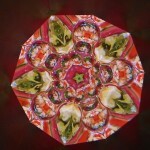 An interior image in the kaleidoscope is the essential part of what makes a kaleidoscope a kaleidoscope. 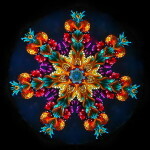 In most kaleidoscopes, it is a private viewing of images that only one person will ever see in that particular way. 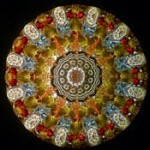 Many kaleidoscopes are categorized in types by what the object case contains or how the image is created. The following descriptions are general ways in which the image is created. 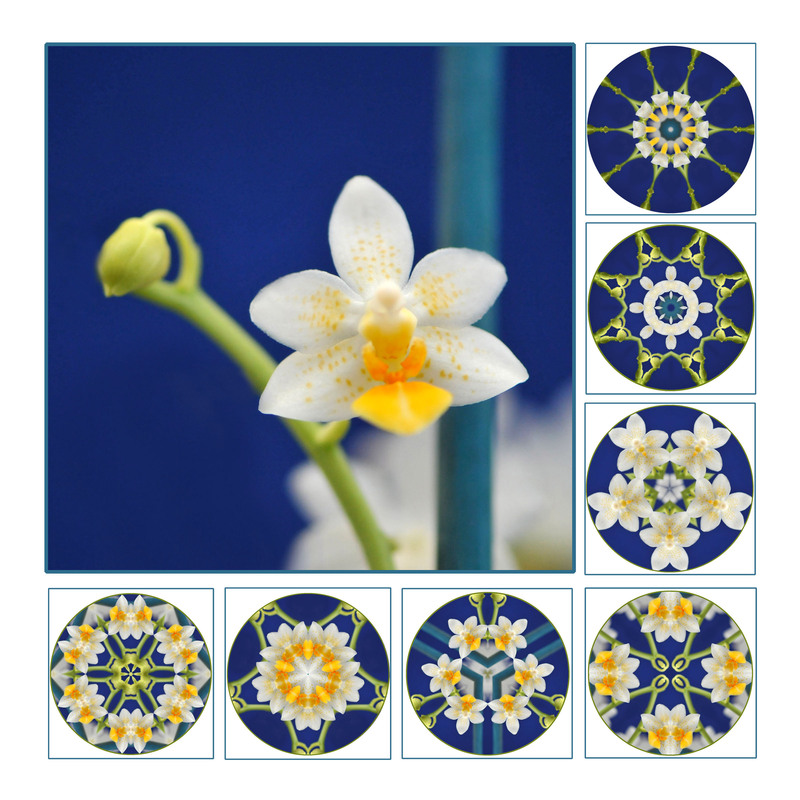 Wheel Kaleidoscopes: A kaleidoscope wheel has a center axis that is attached to the kaleidoscope at the end of the mirrors. The wheels turn in front of the mirrors and create the image. The wheels can be set in a fixed pattern of objects, a cylinder containing loose objects or a carousel in which the viewer can change or arrange objects. The number of wheels can vary and with some kaleidoscopes be removed or exchanged. Cell Kaleidoscopes: A cell is an enclosed object case and usually contains loose objects that move about in the chamber. Some artists have created cells that can be opened and the viewer can add or remove objects but most cells are sealed. Cells can be liquid filled or dry. Liquid cells allow for slower and more flowing motion in the image while dry cells shift quickly but remain stationary until they are moved again. Several artists have developed cells that have been called pucks because they are shaped like a hockey puck. Cells can be any size or shape and are only limited by the imagination of the artist. 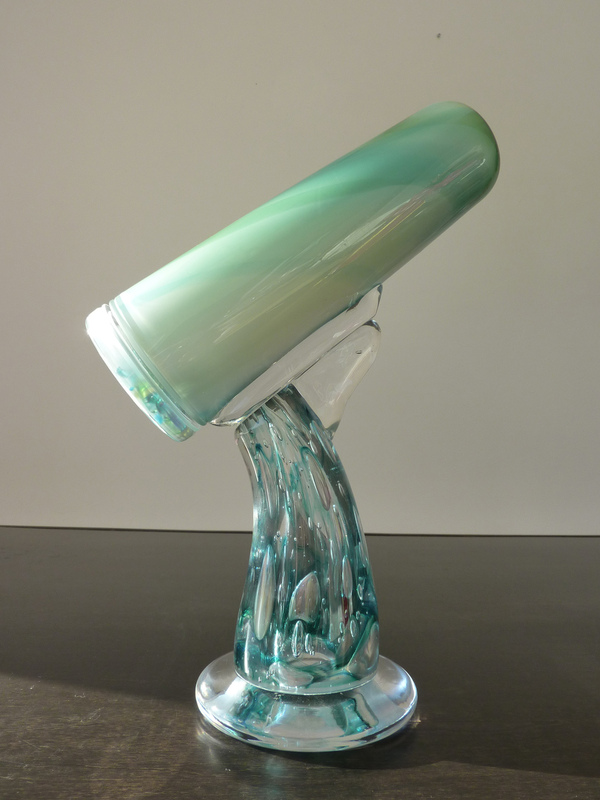 Some cells are fixed to the kaleidoscope so that the whole kaleidoscope needs to be moved or shaken. Other cell scopes allow for the cell to move independently of the body of the kaleidoscope by turning the cell. A special type of cell kaleidoscope uses a polarized lens to create a rainbow effect within the chamber. 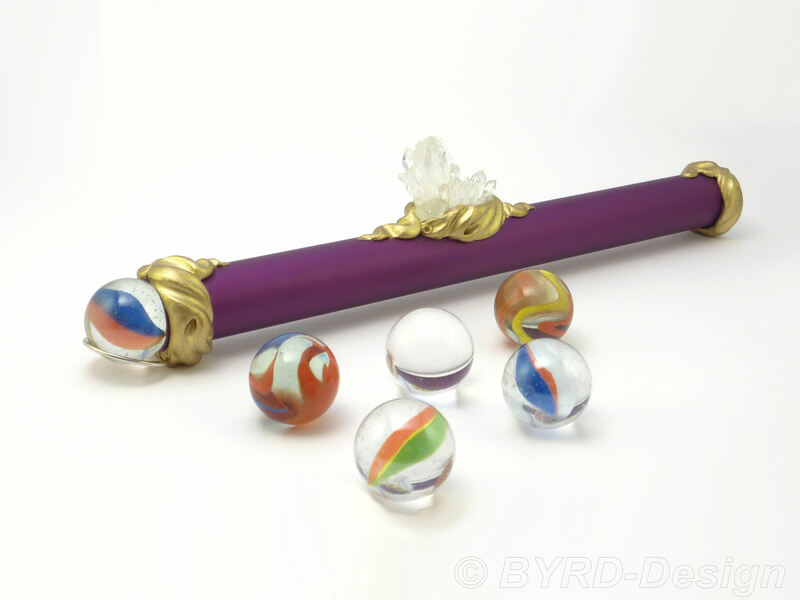 Wand Kaleidoscopes: A wand is a sealed tube that is usually made of glass or plastic and filled with loose objects floating in a liquid. 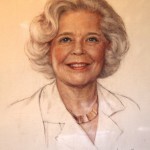 Cozy Baker during one of the earliest Brewster conventions had a three foot wand and a Marti Freund teleidoscope and was showing everyone what a wonderful image this created. In 1990, WildeWood Creative Products in collaboration with Cozy Baker marketed this as a toy kaleidoscope. 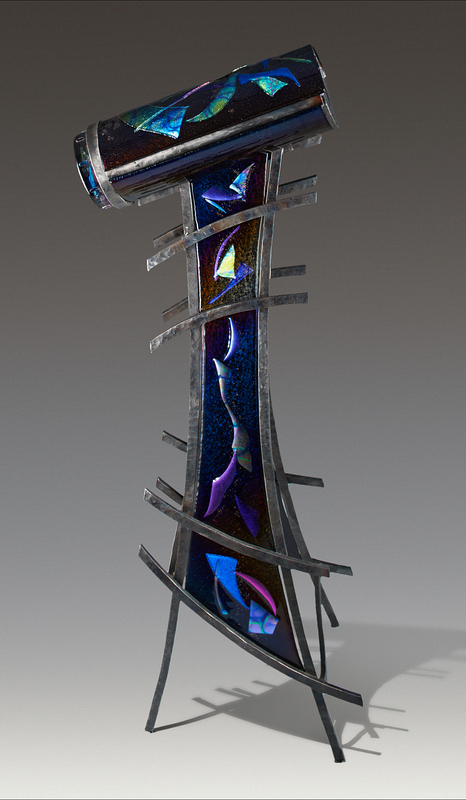 The wand is usually attached to the kaleidoscope perpendicular to the end of the mirror system. The objects in the wand float past the mirrors creating the image. The wand is then rotated to restart the movement. Teleidoscopes: A teleidoscope does not have an attached object case. With a teleidoscope, you look through the mirrors and the world around you becomes a kaleidoscope image. Several artists have created a teleidoscope lens for cameras including camera phones. 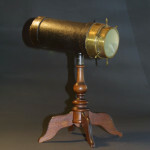 Brewster referred to the teleidoscope as the purest form of a kaleidoscope, because the viewer is not limited by the objects in an object case. Rather, the whole world becomes his kaleidoscope. It’s been said that the ultimate value of the teleidoscope is the potential each viewer has to see his own environment as a creative work of art.